Up to 28 distinguished UP alumni artists take part in the monumental exhibition, SiningSaysay: Philippine History in Art. The project took four years in the making and now, it finally sees the light of day. 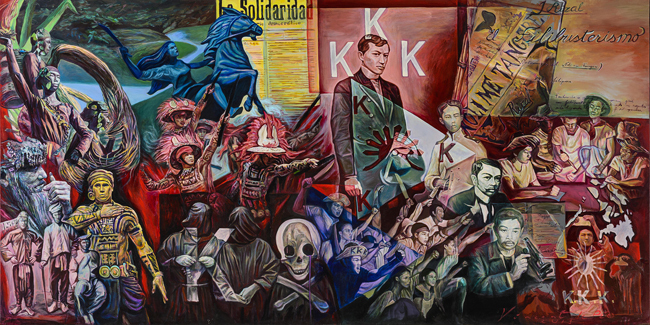 Opening on February 19 on the 5th level of the Gateway Tower Mall, SiningSaysay: Philippine History in Art aims to present critical periods in Philippine history through illustrations in oil and acrylic on canvas by different artists who worked closely with respected historians, Dr. Serafin Quiazon and Professor Ma. Luisa Camagay, to ensure their historical accuracy. The collection features 30 murals measuring an impressive 6 by 12 feet each. 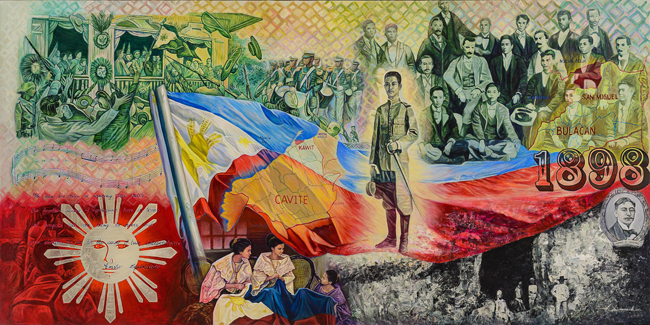 UP President Alfredo Pascual shared, “This is UP’s offering to our country and to our people so that we will never forget our roots; what Filipinos are now as shaped by events in history that this country went through.” It is an innovative way of teaching history as well as promoting art appreciation and imbibing cultural pride. Chosen to take part in the project are artists Adonai Artificio, Armand Bacaltos, Adi Baen-Santos, Grandeir Bella, Benjie Cabangis, Ben Cabrera, Angel Cacnio, Romeo Carlos, Cris Cruz, Denes Dasco, Gig de Pio, Simkin De Pio, Neil Doloricon, Norman Dreo, Amado Hidalgo, Abdul Asia Mari Imao, Ben Infante, Gigi Javier-Alfonso, Aileen Lanuza, Romeo Mananquil, Norlie Meibam, Julius Samson, Jonahmar Salvosa, Randy Solo, Michael Velasco, Jun Yee, and Janice Young. The exhibition is jointly organised by the University of the Philippines (UP), the University of the Philippines Alumni Association (UPAA), and the Araneta Center. It opens in time for the celebration of National Arts Month. It is also the 60th anniversary of the Araneta Center where the Gateway Gallery, touted as the country’s largest private gallery, is located.